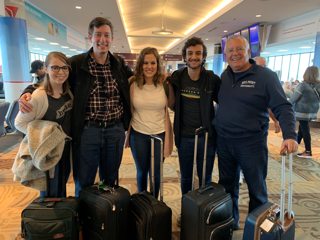 A team of four Belmont undergraduate business students including Claire Gilman, Sean Grossnickle, Katie Murdock, and Anas Saba recently participated in the CIBER Case Challenge hosted by the University of Connecticut. Accompanied by Dr. Eduardo Lopez, the group arrived in Storrs, CT, on November 7 just in time to try the famous ice cream, produced entirely by UConn students on the premises. That night, during dinner, the nine teams met each other each other. There were students from the University of Trento (Italy), the University of Johannesburg (South Africa), University of Connecticut, Belmont University, University of Maryland, University of Vermont, Purdue University and Florida State University. On Thursday, November 8, UConn organized a day trip to Hartford that included a visit to their Hartford campus and a roundtable with industry executives. The CIBER Case Challenge brings teams of four undergraduate students from around the world to compete in analyzing and presenting an international business case to judges. It offers an excellent opportunity for students to gain exposure to international business issues and meet business students from around the globe.